Synopsis: For most families, moving is a new beginning. But for the Creeds, it could be the beginning of the end. 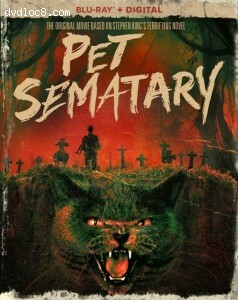 Because they've just moved in next door to a place that children built with broken dreams, the Pet Sematary. It's a tiny patch of land that hides a mysterious Indian burial ground with the powers of resurrection. Master Of The Macabre, Stephen King, will take you and the Creeds to hell and back. (But the Creeds don't have return tickets.) Your tour guide is kindly old Jud Crandall (Fred Gwynn), the neighborhood nice guy who knows the secrets of life, but has seen enough to firmly believe that "sometimes dead is better."